Much of the movie was entertaining, had some really funny jokes, and the special effects were great. Of course the one part that I had issues with was the food allergy scene. It did bother me to make light of what was a serious allergy. However, once I thought about it, I realized that it gave me a great chance to talk with my kids about the problem of food allergies. We are always trying to remind our kids that we need to be thoughtful of others and how we treat people matters. This scene, although unnecessary and hurtful, opened up the door to continue this conversation about friends, family, and strangers that do deal with food allergies on a daily basis. Notice I didn't put any blackberries in this lunch? That was on purpose. It also gave me an opportunity to think about reading some of the original books with my children. 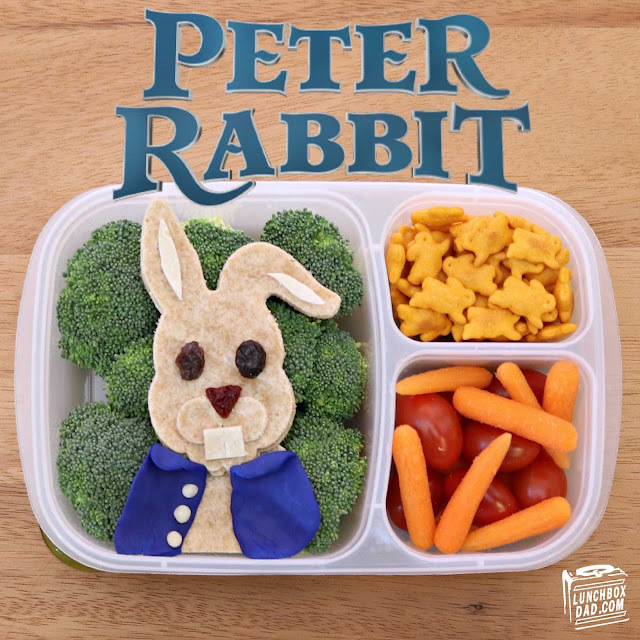 Would Beatrix Potter approve of the new movie? I'm not sure. As I was watching it I felt like it was kind of like Home Alone with wildlife. I do know that the original stories are worth reading though! So if your kids can't handle the slapstick humor, or you don't want to tackle the tough issue of food allergies, you might want to skip the movie. But whatever you do, don't skip the children's books. Those will definitely create some memorable moments with you and your children. And if they like those, this lunch will definitely create more of those moments. 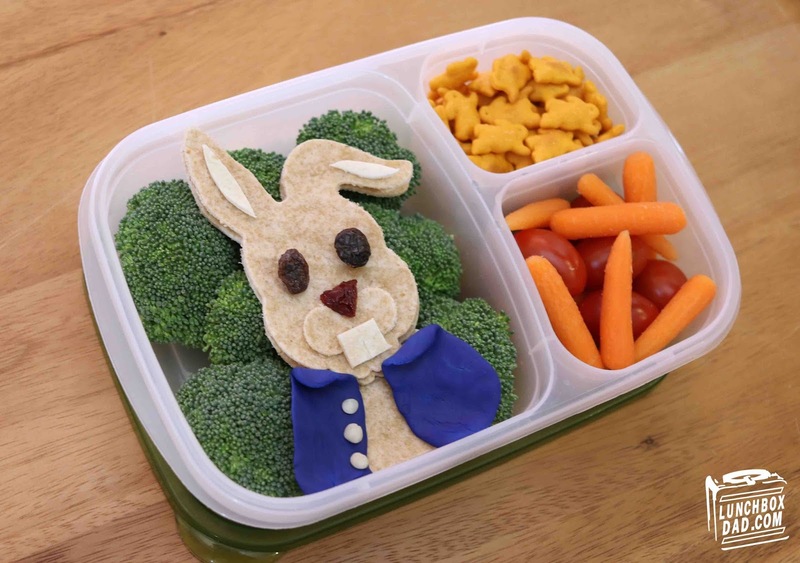 Here are the ingredients I used: Whole wheat tortillas, flour tortillas for the ears and teeth, dried cherry, raisins, cheddar cheese (for between the tortillas), cream cheese (to hold on the facial features), broccoli, carrots, grape tomatoes, cheese bunny crackers, blue and white fondant for the jacket.